Naturally existing light found on location. The background lights also called ‘specials’ in theatre primarily serves the function of highlighting an important object(s) in the background. Properly designed background light greatly aids to suggest three- dimensionality in a frame. The back light is the third source of illumination in the basic lighting triangle and serves the purpose of separating the subject from the background. The camera’s need a minimum level of light intensity to deliver acceptable video footage i.e. without objectionable video noise. Basic lighting triangle or “triangular” lighting engages all three source of illumination i.e. key, back and fill light in the ratio of 1:1:1/2 to properly and artistically illuminate a subject. A lighting technique in which the instruments are aimed at a white ceiling or walls rather than directly at the subject. The light reflected of these surfaces provides a soft, highly diffused effect. A rectangular, open front fills. A color correction gel responsible for converting tungsten light of 3200K to ‘daylight’ color. A light source’s relative position along the spectrum of visible light, measured in degrees on the Kelvin scale. A patterned piece of metal, wood or cardboard placed in front of a Fresnel to project the pattern on a wall or other surface: also a patterned metal insert placed inside and behind the lens of an ellipsoidal light used for the same purpose. Broads used to illuminate, and often to colorize, a cyclorama. A spotlight creating the narrowest, most clearly shaped and intense beam of light of any instrument used in TV production. In the lighting triangle, the light responsible for softening shadows made by the key light. Sometimes also known as a ‘flood’ are lighting instruments that provides diffused light than spots and are tasked with providing fill and base light plus some background and side lighting. Adjusting a lighting instrument such as a Fresnel spotlight to project a broader, more diffused beam of light. Also known as “spread”. Either narrowing or widening the beam of light an instrument emits. The intensity of light falling on a surface placed 1 foot away from a point light source of 1 candle power. The measuring unit for reflected light. Reflected light is the product of incident light falling on an object and the object’s reflectance. The Caucasian face with a typical reflectance of .36 reflects 36 foot lamberts when illuminated with 100 foot candles of incident light(100 f.c. times .36=36 foot lamberts). An adjustable focus spotlight with a unique glass lens, consisting of a series of concentric circles. Similar in design and intent to a Fresnel ,HMI lights operate at a color temperature of 5,600 deg.K, compared to a Quartz lamps 3,200 deg.K. The main source of illumination in the lighting triangle. A type of back light striking the subject from a low angle. Kickers provide subject with a halo effect. The level of brightness provided by a light source. A photosensitive device that measures light intensity. A device used to switch lights on and off and/or control the intensities of one or more lighting instruments in a studio. Also called a “board”. The relative intensities of the key, back and fill lights in the lighting triangle. A lighting accessory used to diffuse the harsh quality of spotlights, allowing them to simulate the effect of softlights. The logical direction in the shot from which the key light should come. A frequently used filter that reduces the intensity of light reaching the camera’s image sensing device(s) without effecting color values. The artificial incandescent light source used most often in television production. The light features a tungsten filament that glows in an iodide (also known as halogen) gas. The “glass” envelope is made of quartz, from which the lamp gets its name. Also called “tungsten-halogen” or “quartz-iodide” lamps. Light that bounces off the subject rather than light striking the subject directly. Fill lights used to provide sufficient baselight in a scene to avoid video noise and flatly illuminate all relevant portions of the set. 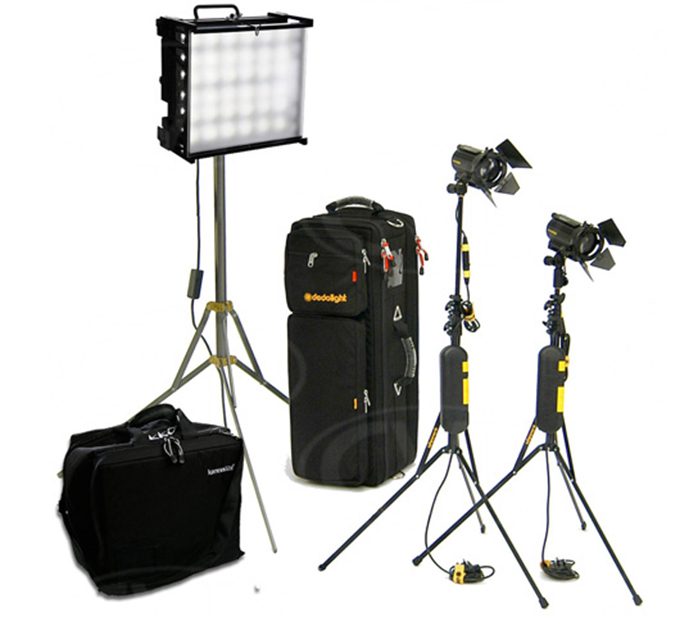 Lighting instruments with beams narrowly focused; used specially for key, back and background lighting. “Grain or “snow visible in the picture, especially the darker areas. Video noise results due to inadequate base light levels.